Guy Kawasaki, author of 10 books including his recent best seller, “Enchantment”, has written the missing manual for Google+. “What the Plus! Google+ for the rest of us”. You can get a copy of the very helpful ebook for only $2.99 here. Despite its decidedly clunky interface, total lack of customer service, and outright confusing names for features, Google has big plans for its social network. Google+ is woven into the fabric of Google search, email, YouTube, and all of the apps and sites Google owns. You may think it’s geeky (it is) but it’s also more than just a digerati playground. “My experience as an Apple evangelist flashed before my eyes: Macintosh was a better computer, and many people didn’t “get it.” Now, Google+ is a better social network, and many people don’t get it, either<" Kawasaki writes. "My goals are to help you to derive as much joy and value from Google+ as I do and that we can make Google+ tip." 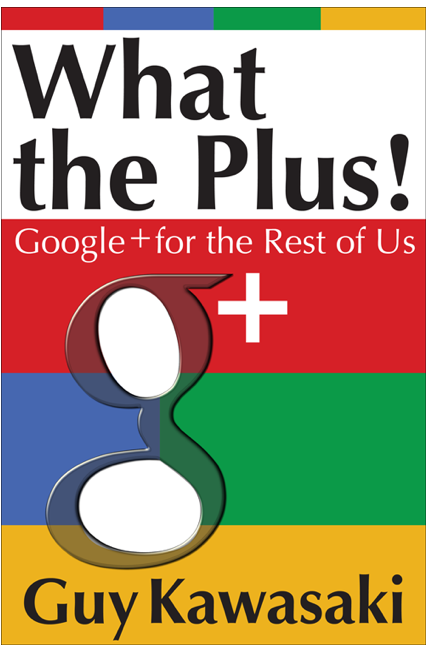 Kawasaki's book tells you how to make the most of Google+, including how to find who's worth following, how to get more followers, how to write content people will want to follow, how to optimize photos (and why you should,) as well as how to create and share a HangOut and much more. G+ is obviously better than Facebook. They have some eye catching options facebook has now recently included, but in my opinion G+ will have to go a long way to beat Facebook. People are already comfortable with it, and it wont be easy to drag the crowd to G+. In my experience with Google+, I created an account as soon as I heard about it just like any other social media. After a couple of days trying to use it and figure all of the different operations out, I gave up and went right back to Facebook. Reason being there were too many different function tabs to handle all at once, where Facebook is pretty straightforward. I do agree with the comment above that more computer-oriented people like to use and understand Google+ way more than the rest of us. Google+ is new, but it’s not going away. A lot of people hate Facebook’s new Timeline and other changes. But they’ll get used to them. Very few of us embrace change. For those who do, with GOogle+, the reward often is direct access to people you’d never meet otherwise. Yes, people who are more active in other areas of social media are the most likley early adopters. But G+ is now incorporated into search, and that’s the heart of Google’s operation. People will catch up. And if they don’t, G+ will continue to be a great place to learn and network for those of us who use it.